Berlin, Germany – As part of Philips’ commitment to deliver meaningful innovation in personal health and well-being, today Saeco – one of Philips’ premium espresso brands – introduces the GranBaristo Avanti concept. With variety and customization at the heart of innovation, the Saeco GranBaristo Avanti will allow you to create the perfect espresso, latte macchiato or any coffee drink with your smart device. This breakthrough connected coffee machine concept further highlights Saeco’s ongoing commitment to providing coffee lovers with the ultimate coffee experience. GranBaristo Avanti is one of several digital innovations Philips is showcasing at IFA 2013. Today’s coffee lovers are more invested in their coffee experience than ever before and desire the same variety, customization and personal preference found in their favorite café, but from the comfort of home. 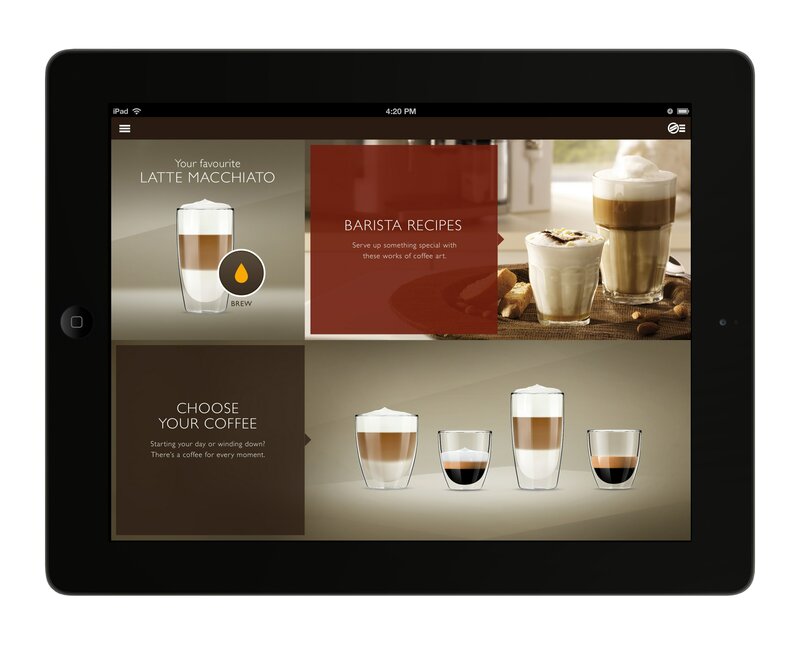 GranBaristo Avanti helps everyone become an at-home Italian barista thanks to a new mobile application connected to the coffee machine via bluetooth technology. The perfect time to relax with a delicious cup of coffee and enjoy time together, is after a nice dinner with friends at home, but it can often be a hassle making coffee for a large group, not to mention take you away from the very people you want to spend time with. That’s where GranBaristo Avanti comes in. Instead of excusing yourself to the kitchen, simply reach for your tablet. As you pass your device from guest to guest, they will delight in the range of coffee varieties available to them. Whether a creamy cappuccino or a rich espresso, guests can customize their favorite coffee to their exact preference, changing its strength, volume and even temperature. Once the order is complete, you can move to the machine and make the customized coffees one by one. Since inventing the world’s first fully automatic, bean-to-cup, at-home coffee machine in 1985, Saeco remains dedicated to brewing the perfect cup of coffee by continuing to deliver breakthrough innovations. With more and more coffee lovers sharing their coffee creations across social media platforms such as Pinterest and Instagram, Saeco GranBaristo Avanti invites you to get social, too. In addition to sharing recipes and images of your favorite coffee drink with friends, GranBaristo Avanti is also a knowledge hub. If you’re interested in exploring the world of coffee, learning how to experiment with different beans or even trying out brand new coffee recipes, GranBaristo Avanti has it all. Furthermore, the machine has a helpful maintenance portal with handy tips and tricks to answer your questions and to ensure that keeping your machine in tip-top shape is easier than ever before. Building on its 122 year heritage of delivering meaningful innovations that have improved quality of life for millions, Philips is responding to the changing needs of consumers today. As their lives become ever more digitally-driven and connected, Philips’ new generation of digital innovations – including the Saeco GranBaristo Avanti concept – are designed to meet consumers’ needs and expectations for greater connectivity, personalization, control and convenience. At this year’s IFA we are showcasing a new generation of digital concepts and products, spanning Male Grooming, Kitchen Appliances, Coffee, Mother and Childcare, and Air purification. The Saeco GranBaristo Avanti is in concept phase so no launch information is available at this time. For further information on the latest Philips innovations from IFA 2013 visit www.ifa.philips.com.